Laser Resurfacing refers to a procedure whereby a certain thickness of superficial layers of skin is removed by a laser, allowing the treated skin to renew it-self as it heals. Most common lasers used for resurfacing fall under 2 categories: CO2 and Erbium lasers. CO2 lasers use a longer wavelength of light, and produce a significant cautery effect, leaving a layer of burnt coagulum on the surface of treated area. Erbium lasers, on the other hand, evaporate tissue, with little coagulation effect. 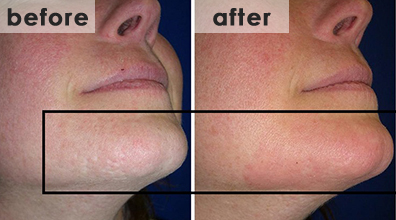 Coagulation effect of CO2 lasers results in less bleeding at the affected site, as well as having a greater effect on skin tightening; however, it is more prone to side effects such as tissue discoloration. Erbium treatments tend to result in more bleeding. Then, there are “tunable” erbium lasers, which can be tuned to cause an operator-defined degree of coagulation. Finally, the latest trend is to use “fractional ” technology, which produces a pixelated dot pattern of treated dots. The advantage of fractional treatment is a greatly reduced healing time, as well as a reduced risk of complications. Laser resurfacing is available at Medical Spa Club, using both tunable Erbium and fractional technologies, for maximum safety and effectiveness. Laser resurfacing is used for treating scarring, including acne scarring, as well as for rejuvenation of aged or sun-damaged skin.